Yemen has expressed sorrow over a UN report on children of conflicts areas, saying that the United Nations was fed misleading materials provide by one side" the Houthi-Saleh militias". 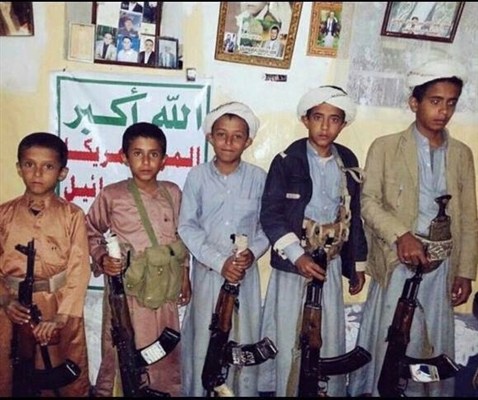 In a press statement issued on Friday, the Yemeni government said it is striving to protect its people, and avoids recruitment of child soldiers, cooperates with the UN and implements its resolutions and international laws. "It is also not acceptable or logical to blacklist the Saudi-led Coalition backing the Yemeni government depending on information and reports fed by armed militias condemned as a rebel group in UNSC resolutions issued under Chapter VII." The statement added. "It should be remembered that the Saudi-led Coalition is implementing the binding UNSC resolutions, on the international community's behalf, to preserve the formidability and status of the this international institution (UNSC) as an authority that the world should refer to and countries feel secure with and trustful of with regards to their peace and stability."